This event features four divisions (elementary school, middle school, high school and adult) of competition. Cash prizes are awarded in each division for first, second and third place winners. Winners will be announced by 6pm the day of the contest. You do not have to be present to win. Participation is limited to 30 entry spaces and judging is conducted ​by the Suffolk Peanut Fest Queen and her Court. 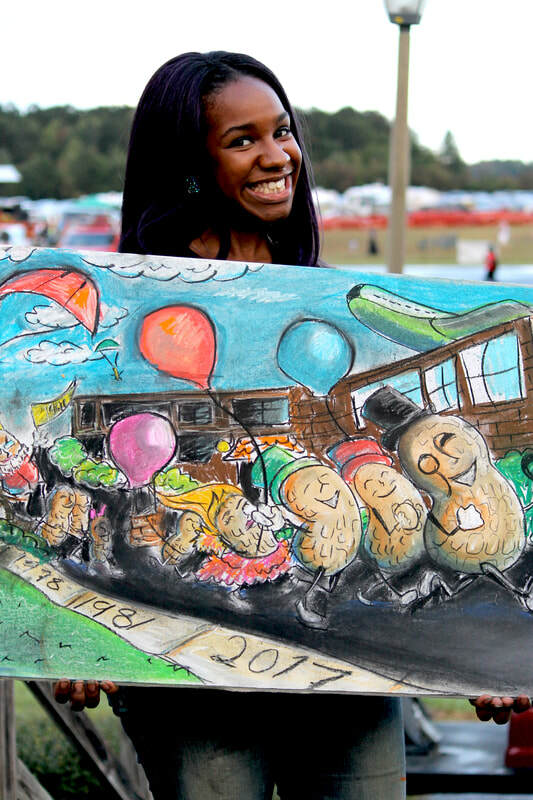 All art must coincide with the Peanut Festival’s theme and must be of good, family-oriented taste. Standard Sidewalk Chalk will be provided, however, participants welcome to bring their own. All chalk must be non-toxic. (Black Chalk or charcoal is not provided). A 2’x4’ plaster-type board will be provided on which to create design. Pre-registration is open to the first 20 applicants. All others can register the day of the contest. Those who pre-register will be given a Suffolk Peanut Festival parking pass, good for Saturday, October 6. Pre-registrations will be accepted until Friday, September 21. Pick up a registration form at Suffolk Art Gallery, 118 Bosley Ave., 23434 or Suffolk Parks and Recreation, 134 S. 6th St., 23434. On-site registration begins at 10am and will end when all 30 spaces are filled. Further rules may apply. Obtain a registration form for more information. Click here for a Registration Form.